I've started planning Happy Vee's 1st birthday party, so it's only fitting that I reminisce (just a little!) on the Cowboy Party that I threw for Smarty Pant's first birthday just two (short, short) years ago. Oh no! Here it comes-- I can't my little baby is almost one and my big baby is now a little boy! (sniff) As many seasoned parents can attest-- childhood really does run, skip & jump by quickly! The Setting-- Isn't this park beautiful? Lots of beautiful old trees, a quaint bridge to walk over, and there's even a small stream... with ducks, of course! Here's a picture of the picnic pavilion. Unfortunately I didn't get a closer shot of the tablescape. It's pretty simple actually-- red & white checkered tableclothes and the centerpieces were mini bales of hay with balloons tied around them. I also had small metal buckets filled with sunflowers on some of the tables. Every Cowboy Party needs "MOST WANTED" posters. These were a hit with kids and parents alike! I gave each child an Outlaw name and a "crime" that fit their personality. I even looked up "cowboy jargon" online so I could make it as fun and authentic as possible. Since I didn't have a wall to hang the posters on, I borrowed this presentation board from Daddy Vee. 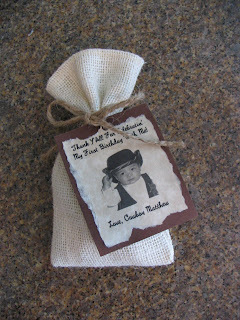 The Favors - Nana Tee sewed these favor bags for the party. We filled them with Almond Roca since they kinda, sorta resemble gold bars. I'll be back later with more Cowboy Party pictures!